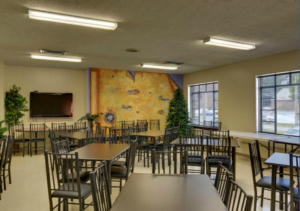 The Explorer Café at Discovery Station is available for those who wish to bring brown-bag lunches or their own snacks. A vending machine is also available. Those who use the café lunchroom are asked to clear their tables when finished and place trash in receptacles provided. No food or beverages are permitted elsewhere in the museum facility except by special permission. Maximum group size for Explorer Café lunchroom privileges is 49. Groups may arrange for their own catered food service from outside vendors with advance notice to the museum. Vendors are responsible for cleanup and waste removal from the premises resulting from their service.